Guinea Pig Club memorial by "Graeme Mitcheson"
I have begun carving work on the Guinea Pig Club Memorial which will be unveiled at the National Memorial Arboretum on the 2nd November. The Guinea Pig Club was established in 1941 by Allied Service airmen who had suffered severe burns. They were treated by pioneering plastic surgeon Sir Archibald MacIndoe in East Grinstead in Sussex. During their treatment, they formed the Guinea Pig Club which served as a means to support one another through their recovery and for the rest of their lives. Today, only 22 of the 649 members are still with us and together they have commissioned the memorial to commemorate the club and the work of Sir Archibald Macindoe and his team who transformed so many lives. The Guinea Pig Club memorial will is being carved from a giant piece of green Cumbrian slate, 2.2m tall. It contains the logo of the Club, the profile has an outline of a spitfire wing on one side and the negative profile of the face of Sir Archibald MacIndoe which is being traced by the smoke and flames of a crashing Hurricane. I travelled to Cumbria a short while ago where I was able to hand-pick the green slate form thousands of pieces in the Burlington Slate yard, affectionately referred to by staff as the”Graveyard”. The thickness of 160mm was particularly difficult to find but I wanted the memorial to be as bold as possible. 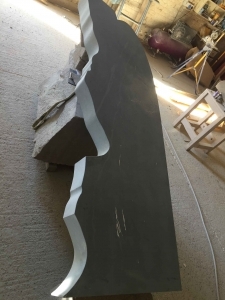 The slate is very hard to cut and although it carves nicely, it is very slow going. Nevertheless, the contrast between the cut surface and the polished surface is working really well while some of the texture that I have been able to achieve would not have been possible on other stones. 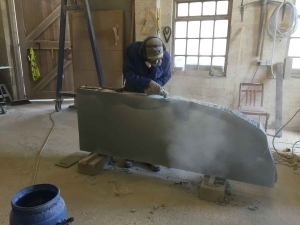 I will post further images of the memorial as it progresses prior to installation at the National Memorial Arboretum in Staffordshire in the coming weeks.